Bridgestone manufactures passenger, light truck, and off-road tires in South Carolina. Austin Chaney started his co-op with Bridgestone while pursuing a mechanical engineering degree at Clemson University. Despite being a student, Austin is still treated as an engineer. Daily, he meets with people from other areas in the plant to give updates on current his projects. In addition, he leads teams of Machine Technicians, Crew Leaders, and Maintenance Technicians to address issues and improve processes. 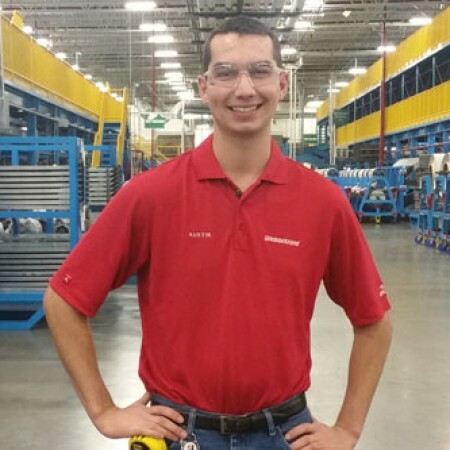 With the valuable knowledge and hands-on work experience he has gain during his studies, Austin has the opportunity to continue to work for Bridgestone up graduation or other engineering companies.